3 times a day. Add snack times. It is almost a full time job. Too many food rules … or the wrong food rules? Not only you have to plan, prep and cook, but once seated at the table, you job is not quite done! Between keeping the peace, and making sure everyone is eating, it can be discouraging. It can also quickly become out of control! We know it comes from the best intentions and can only command your love and efforts in wanting to give them the best all the time…but we have YOU in mind too. How much pressure do you put on yourself? What if you could simplify your role? Kiss goodbye to these food rules that just stress everyone but don’t get you the results you’d hope for! 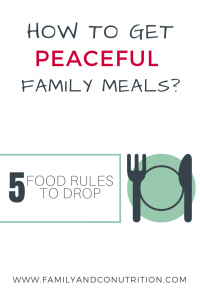 Let go of these 5 commons food rules parents impose on kids. From now on, you can officially let go. Forcing kids to eat a bit of everything at every meal is not the solution to get them to like it and eat it out of their freewill. Instead, the more you ask, the more likely they are to refuse. And then everyone gets annoyed. You. The kids. Your partner. Lead by example: take pleasure yourself in eating food. Seeing you eat with appetite and pleasure a variety of food can only encourage your children to do the same. It is also okay to serve food you don’t like, take only a few bites and explain (for the sake of “educating” them!) that it is not your favourite food. “I won’t cook fish because anyway my kids don’t like that and would never eat it”. Is that something you’d say? And it makes sense, because who wants to put efforts in cooking a meal no one will touch? First, because it is likely that YOU are looking forward to eating it (otherwise that meal wouldn’t be on your radar!) and you deserve to enjoy food you like. It is not always about pleasing the kids. Second, because who said they won’t change their mind one day and take a bite, or two and decide they really like this meal after all? Pair food they tend to not like with food they know and enjoy: It is reassuring for kids to have some items they can fall back on. It’s not all about pleasing the kids. Cook meals that you wish everyone would enjoy and eat without complaining. 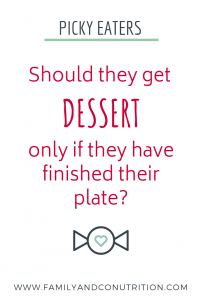 That one is a hard one as many of us might have grown up being told to finish our plate to be “rewarded” to a nice desert. We strongly discourage using food as a reward for anything. Food should be seen as “neutral”, in the sense that there are no bad or good foods. Sure there is more festive foods than others, but all food have their place in your family diet. 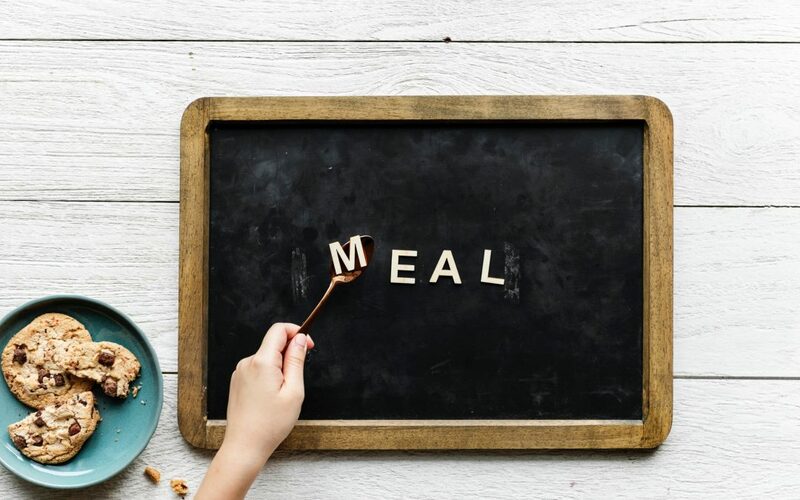 See dessert as part of the meal: Some experts even suggest to serve dessert on the table with the main meal, so kids can see what is offered and decide how to manage their appetite, what to eat, in which order, how much of each components. You can have nights where there is a dessert, and nights where there are no desserts. You make the rules! Remember you decide what is for dessert: If you don’t want them to eat ultra-processed dessert, don’t buy it. Offer in season fresh fruits, or yogurt and granola, or muffin for dessert. 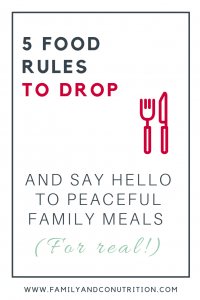 Agree on family rules: if kids don’t behave as per your established rules, you can decide that meal time is over for them regardless of it they had done their main meal and/or desert. 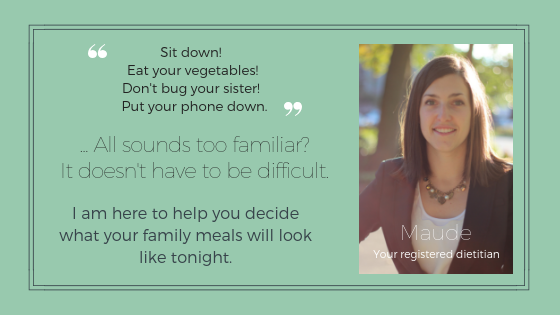 You decide when and where your family eats dinner, and you decide what is served. You decide on the quality, they decide on the quantity. Regardless of how much of their plate they ate. 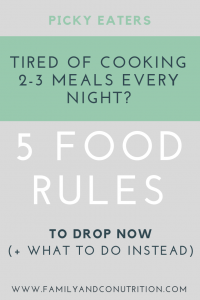 Food rule #4: Cooking a second meal for my picky eater? That is just too much work for you! Cooking 2-3 meals each night? Hell no! 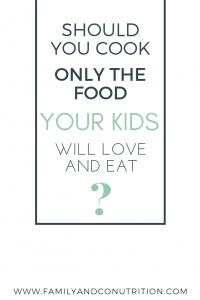 But more seriously, we want to teach your child to pick from what is available on the table at that meal. You want to get them to expand their palates! In life, there shouldn’t be kid foods vs adult foods. Remember that your kids learn by imitating you, so leading by example is your best bet. Everyone is offered the same food at every meals, and each family member decide if and how much they feel like eating at that moment. Sadly, just like in real life, if you don’t like something it doesn’t mean that we will prepare something else until we please you. 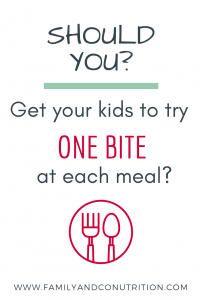 Get them to choose one meal a week they want to eat: it is likely to get them to be more adventurous having chose what was for dinner that night! Decide of the weeks menu and make it visible to the family: this is what we eat. end of the story. If they aren’t please, they can volunteer themselves to participate in the menu planning, or even better, to cook the meals! Don’t go overboard with too many items on the table: too many surprises and too many choices can actually be stressful for kids. 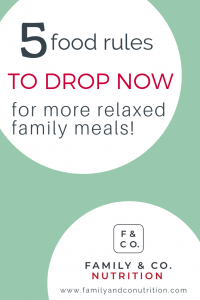 You offer meals that might include favourites AND novel items, and that is part of learning to eat! 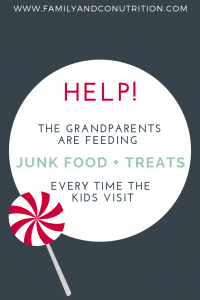 Food rule #5: Restrain the grandparents from feeding them all that junk when they visit? How often do they visit them? There is a difference between occasional visits (and treats) and regular weekly meals with the grandparents. Part of the food learning is for your kids to know how to deal with ALL foods! They will never live in a bubble where only curated healthy options are gonna be available to them. You need to guide them to learn tow to respect their appetite, to discover new flavours, textures and tastes. To do so, it requires them to have a solid healthy foundation, but also exposure to non-nutritious food options. What we aim for is that most of the time, most of their diet is healthy. All food have their place and we don’t want to create obsessiveness over any food in particular. We don’t suggest banishing food either, as this just makes it more tempting and more appealing to indulge and to over eat. We don’t want to take away the pleasure associated with food. We don’t simply eat for nutrition and meeting our needs. Food should bring joy, and family moments with the grand parents are an excellent example of such occasion! 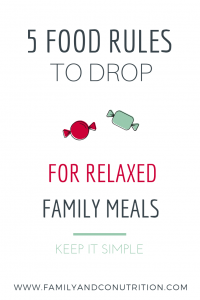 If grandparents take care of your children on a weekly basis, establish the weekly meals with them: agreeing on the food to be serve can ensure no surprises! Eating treats with the grandparents on occasion can be part of creating nice memories, which is also the purpose of food: to be savoured! Ready to make nutrition changes? How to find the right registered dietitian for you?